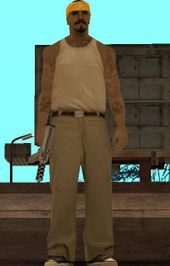 Freddy is a character in the 3D Universe who appears as a minor character in Grand Theft Auto: San Andreas (set in 1992). He is a member of the Los Santos Vagos and lives in East Los Santos, Los Santos. His voice actor is not credited, despite Freddy talking in his only apperance. Freddy, presumably born in Los Santos' poorer neighbourhoods controlled by the Los Santos Vagos, joined the the Los Santos Vagos gang and at some point prior to 1992 was sentenced to prison for an unknown crime. He was joined in his prison cell by aspiring rapper and Grove Street Families member OG Loc, who after being released asks Carl Johnson for assistance in confronting him, claiming Freddy stole his rhymes and disrespected him. Freddy, however, insinuates that he had prison raped Loc, saying it was a "prison thing" due to the lack of "muchachas" inside prison. Loc and Carl later locate Freddy inside his house in East Los Santos, although Freddy escapes through the back door and on to a PCJ-600. Loc and Carl give chase and follow him through the freeway and to a basketball court full of Los Santos Vagos gangsters. Carl and Loc kill the gangsters and Freddy, before driving to Loc's job at Burger Shot in Marina. Carl Johnson and OG Loc can kill Freddy while travelling on the highway, although the cutscene showing the Los Santos Vagos gangsters still appears. During the mission OG Loc, Freddy drives an invulnerable PCJ-600. This page was last modified on 9 November 2013, at 21:14.